If you want to do the Maldives or if you have been before and loved it then this is the trip for you! I’m excited, I’ve never been this far south and it looks amazing! 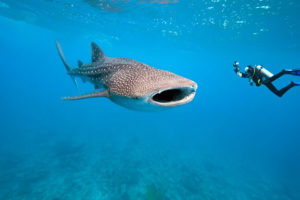 Oh yes we are going DEEP south to some of the most amazing dive sites that the Maldives has to offer. In fact we are going so far South that at the end of the 10 nights we will have to fly back to Male to catch the plane home! We will again be aboard the M/Y Voyager, a superb Liveaboard that boasts spacious cabins, three lounges and fantastic sun decks. The vessel is superbly equipped and is superbly suitable for Non Divers who would be very welcome to join. The ocean deck is a unique feature allowing guests to relax in the open air while being close to the water. On many evenings the flood lights will illuminate the water just off the ocean deck to attract plankton which brings the manta rays and whale sharks in. There have been many close sightings of feeding mantas and whale sharks, have your camera ready and you might even get splashed! 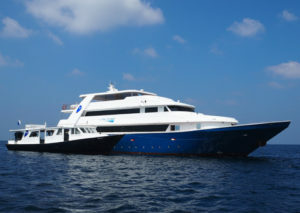 One of the most outstanding features of M/Y blue Voyager is the custom-built dhoni (diving suport vessel) blue Shadow. 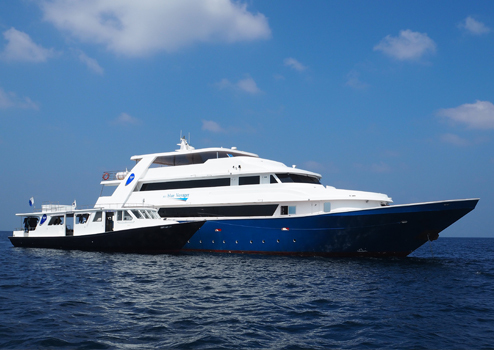 This 19-meter dhoni is spacious, fast, and equipped with all the modern conveniences that divers want. All diving will be done from this purpose built boat. Each diver has their own station with plenty of space store their gear and kit up, and the dhoni crew are always ready to assist. During the journeys to and from the dive sites, you can ascend the small stairs to the top deck to enjoy the sun and stunning views. One of the most popular channel dives; although relatively shallow, it stretches for 250m and white tip reef sharks are frequent visitors. 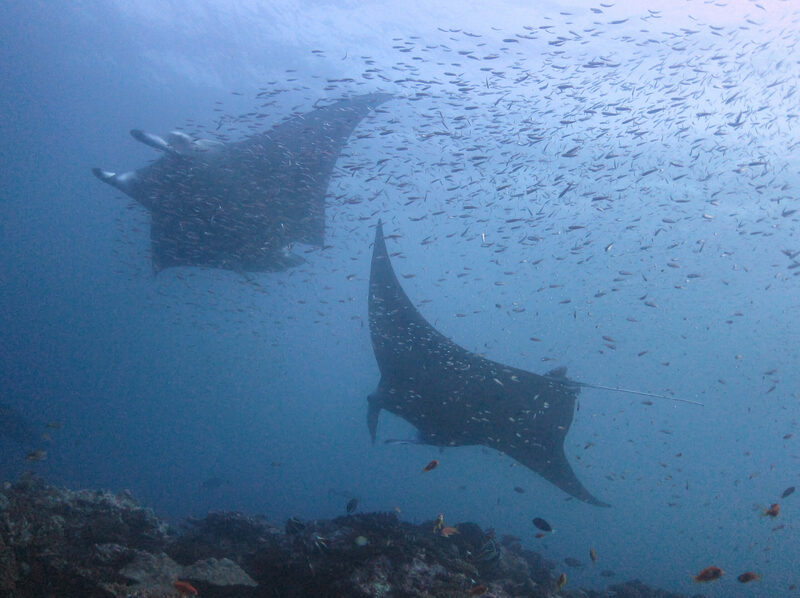 So too are schools of jacks, as they surge in among tuna and eagle rays. Schooling fish and jacks attract large numbers of white tip reef sharks. Tuna and eagle rays wait for the leftovers and the occasional large Napoleon wrasse can be seen nibbling on corals. The north east is peppered with submerged pinnacles covered predominantly in soft corals, whilst the west will see you surrounded by jacks and snappers. Keep an eye open for sharks and rays at 30m! Since the eastern side of the channel is open ocean, large predatory fish can regularly be spotted here. This site is famous for sightings of sharks, schools of eagle rays and the occasional sail fish and hammerheads. The best condition to do the dive is when the current is flowing into the Atoll. The dive begins on the outer reef following the current into the atoll. Most of the pelagic species can be observed on the eastern side, where the reef drops off into the deep ocean. At the end of the dive in the channel, along the reef you can find overhangs with plenty of soft coral growth and small fish. Located in a channel, the reef is subject to strong currents at times. The ocean currents carry a lot of nutrients to the reef, supporting an abundance of sea life. The site is well renowned for the soft coral growth, turtles, diverse fish life and invertebrates found on the reef. 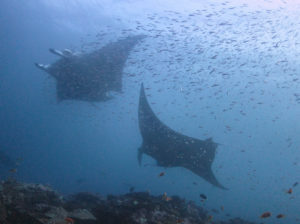 At the reef slope you may find sharks and eagle rays. Hi Simon, I just wanted to say again, a big thank you to you and Vic and the rest of the instructors for all your help and patience in helping Scott through his open water course. It really was a fantastic weekend, every person on the trip was genuinely friendly….a great bunch of people. You seem to have made a lasting impression on Scott as he doesn’t care about the cold water now, he keeps telling me he just wants go back and dive again asap….He loved it. Thanks again for everything. Thanks again for a fantastic weekend, it’s not possible without the time, commitment and organisation you both put in with the rest of the dive team you have built. I never felt unwelcome by anyone all weekend and I tried to make others feel that way too. It’s such a refreshing warm atmosphere in the club which is why I’ve returned and will continue to do so, that mixed in with the hospitality at the kings arms, I couldn’t have made a better choice of club to dive with in the UK. I simply can’t recommend Simon, Vic and the team at Stellar Divers enough, with not just amazing diving tuition and support but also many laughs and great trips together. A very big thank you to all the team at Stellar Divers this weekend at Capernwray. We had such a warm welcome at the pub which continued through out the weekend. A special thanks to Alice who was just amazing, putting us at ease and going above and beyond in her responsibilities. We successfully completed our AOW and Dry Suit course under the guidance of “Sea Si” Thank you Simon for making the final dive a little bit more special by allowing time to just enjoy the fish. An amazing club with amazing people. Had an absolutely amazing weekend in capernwray with my 12 year old son and his grandad. Vicky and Dan have both been amazing with him and we cannot thank you enough for the support and encouragement you have given him. Jack is thrilled to have qualified this weekend. Thank you once again. I just want to Thankyou both once again for helping to get where I am today. If it wasn’t for you guys teaching me how to dive I would never have this amazing Job’ hope I get to come and dive with you both again soon! PADI OWSI #407000 Specialty Instructor ? almost MSDT now!! Just wanted to say a big thank you for all the excellent training, tips and advice your team gave me on my Open water course. I had an excellent time at Capenwray meeting new people and putting my new skills to the test. Think it’s safe to say I’ve got the diving bug 🙂 you’ll definetly be hearing from me pretty soon about booking the advanced open water course! Thanks again, Kieran. Well that’s it Open Water diver complete massive thanks to Simon Hotchkin and Victoria Hotchkin and the rest of the team at stellar divers and a big thanks to Bali scuba team what an awesome day cheers everyone. The DSD course was superb! Thanks for yesterday the DSD course was superb. Both Helen and Gilly were fantastic and a pleasure to be around (can’t be praised highly enough). I would also like like to come back. The team at Stellar have been fantastic, they are friendly and patient, we loved every minute. The Maldives at Christmas was beautiful and we both want to do more now so roll on spring and our advanced open water. Thanks again everyone, see you in March. We went diving on holiday and had a bad experience but we wanted to try again. The way stellar have been has been wonderful especially Vic and Sian. Everyone is brilliant, right from the first day we met at the office everyone has been patient and kind. If you want to scuba dive you need to train here, we’ve found our happy place. You have created something special! I just wanted to say thank you for a brilliant weekend at Capernwray. At no point did I feel like an outsider, yourselves & everyone in the group made me feel welcome. I was a little apprehensive about the dive but the professional way you looked after us made me feel safe at all times. You have created something special and I wish you every success for the future. Thanks again. Simon, I would like to express how wonderful the experience Grace and I had at your dive centre today and to pass on our thanks to Petra and the two gentleman who made the experience so enjoyable. Hi Simon, Just updating you on my progress 🙂 I have 1 more dive to do before I can start my DM, and 11 more to go before it’s completed 🙂 just want to thank you for all the help you gave me at the beginning if it wasn’t for you I wouldn’t be where I am now, malta is amazing for diving! I’m doing 2/3 dives a day! I love it! Completely filled my dive log, have a new one to start using now 🙂 Dived with tuna last week, it was surreal! I never knew how big they actually were!! Hi Hotch & Vic, Just wanted to drop you a line as I didn’t drown to say thank you. From the warm welcome & even a reassuring hug from Hotch on Sunday. The whole experience was so good. Petra, Alice & Dan were all amazing. Everything was explained clearly & all my anxieties floated away from the first underwater breath. I would love for you to let me know what the next step would be. Where did seven years go??! Brrrr, where are you Spring! !